Method Homes just came out with a new series of green prefab structures named Balance S-M-L. These building modules are constructed to be 95% complete upon arrival, and complete within 2-3 months of purchase. I have always been a fan of the newer green prefab house design, and these are a perfect example of what makes them great. Smart, efficient and well designed, the series of self-contained modular units. Great design and quality construction can also be affordable, with custom detailing and natural modern aesthetic at prices starting under $100,000. 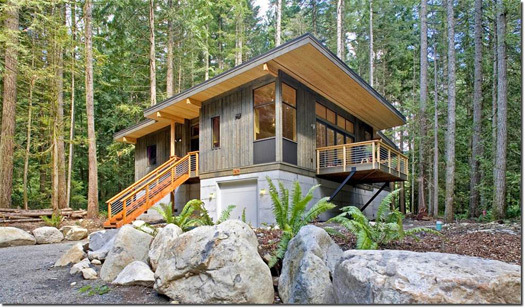 The Balance Medium (pictured at top right) is spec’ed out as a small cabin-style residence, perfect for a couple’s retreat in the mountains, or beach shack. With larger options also available within the series (the ‘L’ is 992sqft, 2bed, 1bath unit), and more offerings through various builders, you can be sure to find the prefab that’s right for you.